As the busy September season of trade shows and exhibitions kicks in across the country, businesses are preparing their promotional materials to display their services in the best possible way. Although traditional banner stands are the first choice solution for many marketing professionals, they can easily become damaged, quickly looking worn and needing to be replaced regularly. PrintDesigns urges businesses to consider alternative display stand products for a more sustainable solution, highlighting the benefits of its range of TEXStyle fabric exhibition stands and accessories. Using high quality graphics that are printed onto one-piece of stretch fabric, this collection of innovative display stands offers great value for money with a low environmental impact. Each unique fabric exhibition stand from the range can be re-used time and time again – with no need to dispose of the graphic when it gets dirty the strong, resilient printed fabric is machine washable, giving brands a fresh looking display stand at every event. As well as being hard-wearing, the fabric graphic on this ‘new breed’ of display stand can be easily recycled with other textiles when it does reach the end of its life. And due to the flexible nature of the textile printed graphics, they can easily be folded and transported to trade shows across the country without any worry of creasing or ripping the banners. 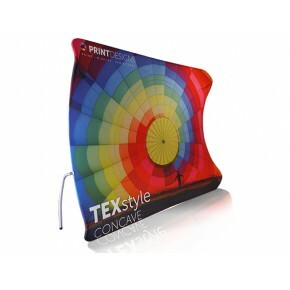 What’s more, the TEXStyle display stand solutions are around 1/3rd of the weight and volume of conventional banner stands, making them incredibly portable and simple to store. PrintDesigns stock a selection of these fabric display stands in a wide range of styles, with bundle deals available for those that want more than one of these unique solutions. Distinctive shapes such as a ‘swirl’ ‘surge’ and ‘icon’ are on offer, as well as more conventional banner shape designs.